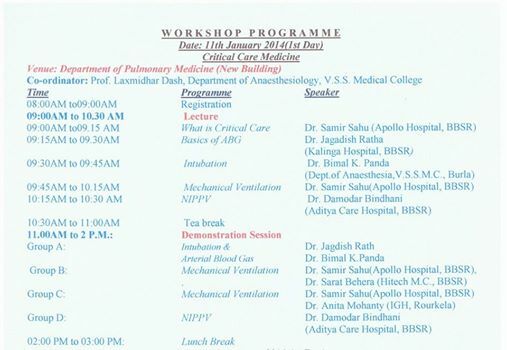 Workshop on Critical care was organised on 11th January 2014 at department of Pulmonary Medicine. There were more than 100 participants attended the said workshop. Speakers from the leading ICU of Odisha like Dr. Samir Sahu (Intensivist, Apollo Hospital, BBSR), Dr. Jagdish Rath (Intensivist, Kalinga Hospital, BBSR), Dr. Damodar Bindhani, Intensivist, Aditya Care, BBSR), Dr. Sarat Behera, Intensivist, Hitech MC, BBSR), Dr. Anita Mohanty (Intensivist, IGH, Rourkela) were given their talk & skill demonstration to the participants. The 10th Chestcon, Odisha, the annual conference of Odisha Chest Society was organised by department of pulmonary medicine, V.S.S. Medical College on 11th & 12th January 2014. This conference was organised under the chairmanship of Prof. Pravati Dutta, HOD of Pulmonary Medicine & organising secretary by Dr. Sudarsan Pothal, Assistant Professor. More than 150 participants were joined at this conference. National level speakers like Prof. Rohit Sarin(Prof & HOD of ), Prof. Digambar Behera(Professor, PGI, Chandigarh), Prof. Surya Kant(Prof. & HOD of Pulmonary Medicine, KGMC, Lucknow), Prof. A.G.Ghoshal(Director, Asthma & Allergy Institute, Kolkata), Prof. Narayan Mishra(Former, President, Indian Chest Society), Prof. R.N.Mania, Prof. Manoranjan Pattanaik(Prof. & HOD of Pulmonary Medicine, MKCG Medical College, Berhampur), Prof. Jytoti Pattanaik(Profe & HOD, Pulmonary Medicine, S.C.B. Medical College, Cuttack), Prof. B.N.Panda( Medical Superintendent, SUM Hospital, BBSR), Prof. P.R.Mohapatra(Prof. & HOD of Pulmonary Medicine, AIIMS, BBSR), Dr. Uma Devi. There were discussion in topic like, COPD, Community acquired Pneumonia, ILD. Post graduate students of different medical colleges presented their research in free paper session.